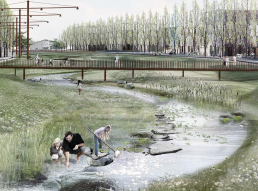 By reopening the stream, Østerå, a new recreational blue-green zone is created through Aalborg, which also makes the city more robust against extreme rain events. For more than 100 years, sections of the 15 km long stream have passed through the city of Aalborg, kept underground by concrete. With more frequent and powerful cloudbursts, the stream has not had the capacity to direct rainwater away from the sewer systems, which has led to flooding. Through several different stages, plans are underway to reopen parts of the stream’s watercourse, enabling the canal to ease the sewage system at times of large runoff. At the same time, the project will create a coherent recreational path through urban areas under that are development. Along the pathway created by the reopened watercourse there will be attractive green spaces which call on locals to get active. Closely linked to the reopening the watercourse is work on sewer separation in the Aalborg Municipality. The areas discharging surface water to the stream are prioritized for sewer separation, in order to ensure that concentrated wastewater flows to the sewage treatment plant, while cleaner rainwater flows into the streams and fjord instead. This ensures a clean aquatic environment, recreational values promoted around the stream and a city protected from floods. Besides easing the sewer systems, the reopening of the stream will create a recreational exercise route. Sewer separation allows for the reopening of the Østerå stream, previously enclosed underground due to low water quality. Now, biological diversity will also be improved with the open and clean watercourse. By increasing capacity for rainwater drainage from the stream’s catchment area, the project makes Aalborg more robust against extreme rain events which are likely to be more frequent in the future. Work is underway to remove the last blockages for fish and fauna in the watercourse, improving biological diversity. Studies show that the density of trout in the stream has risen already.